Pip pip and Cheerio! I can see a Dr Who fan loving these outfits! For the fella in your life who loves a little speed and excitement, Aston Martin, a top British manufacturer of luxury sports cars, brings us this collection of apparel. Union Jack flag designs, and easy-to-wear shirts with car graphics, he can channel the classic auto without the hefty price tag. 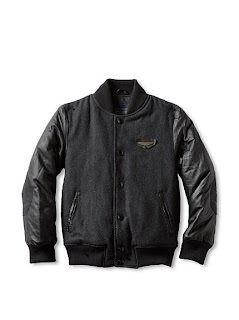 Our favorite item here: The wool varsity jacket with faux leather sleeves and elbow patches. NOTE: If this is your first time, after you sign in, click on the "Children" tab, then "Aston Martin Boys"